中国山西省からハドロサウルス上科恐竜記載 - dinopantheons jimdo page! Photos of caudodorsal part of the skull of Yunganglong datongensis (SXMG V 00001). 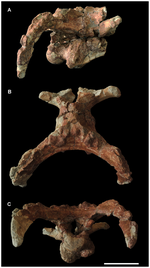 A New Hadrosauroid Dinosaur from the Early Late Cretaceous of Shanxi Province, China.